VANCOUVER, CANADA – Kaizen Discovery (TSXV: KZD) is pleased to announce results of a recently completed rock-chip sampling program on various prospects within the company's newly acquired Coppermine Project in Nunavut. The project is located a few kilometres from the coastal village of Kugluktuk, and includes crown mineral claims and prospecting permits as well as Inuit Owned Land, mineral exploration agreement applications covering more than 4,000 square kilometres. "These results confirm the spectacular high-grade nature of copper mineralization in the basalts of the Coppermine District. This type of mineralization was the focus of a major staking rush in the 1960s. Since then, there has been little systematic exploration in the area. We look forward to further exploration in this fascinating geologic environment, which hosts a large number of these high-grade occurrences," said B. Matthew Hornor, Kaizen's President and Chief Executive Officer. In addition to the volcanic-hosted copper, mineralization also occurs in the lesser explored, neo-Proterozoic Rae Group sediments overlying the basalts. Here, the copper mineralization is controlled by stratigraphy, wherein the copper occurs as disseminated sulphides within gently-dipping siltstones and/or sandstones. There has been no recorded exploration for sediment-hosted copper in the area since 1992. Kaizen plans to conduct exploration programs consisting of mapping, sampling, geophysics and drilling on both the high-grade Coppermine basalts and sediment-hosted copper targets in 2015. Under a January 2014 framework agreement with Kaizen, ITOCHU Corporation has the priority right to fund any future exploration programs contemplated at the Coppermine Project at terms to be agreed by the parties. The framework agreement between Kaizen and ITOCHU Corporation established a collaborative working arrangement under which both companies agreed to evaluate opportunities to explore and develop selected, high-quality, international mineral projects. The rock-chip samples are semi-continuous and taken across near-vertical mineralized structures and are meant to represent true widths. Sampling was carried out during August and September 2014 by geologists from Tundra Copper Corp., now a wholly-owned subsidiary of Kaizen (see Kaizen's November 12, 2014 news release). The rock sampling was focused on historic showings contained within the volcanics of the Mesoproterozoic Coppermine Group. The majority of these copper occurrences are structurally controlled along steeply-dipping to near vertical fault fissures and fault-breccia zones in the basalts. Mineralization occurs mainly as disseminated to semi-massive bornite, chalcocite, malachite and lesser chalcopyrite, variably associated with quartz, calcite, hematite, epidote and chlorite. 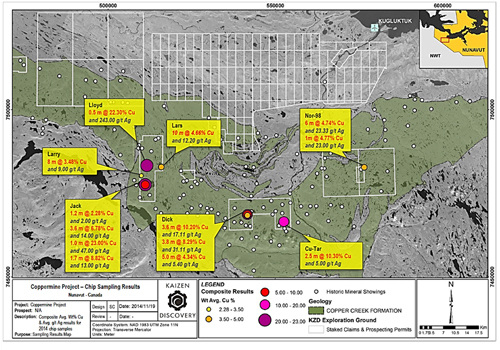 Figure 1: Rock-chip sampling results for Coppermine Project. The exploration work reported herein was conducted by Tundra Copper personnel. Chip samples, weighing between 0.17 and 4.6 kilograms, were collected and placed in sealed bags and delivered to ALS Minerals in Yellowknife, Northwest Territories for sample preparation. Sample pulps were assayed at ALS Minerals' laboratory in North Vancouver. All samples were analyzed by four acid digestion and 33 element ICP-AES, including silver (Ag) and copper (Cu). Overlimit Ag (>200 grams per tonne) was analyzed by four acid digestion and Ore Grade ICP-AES or AAS finish (OG62). Overlimit Cu (>10%) was analyzed by four acid digestion and Ore Grade ICP-AES or AAS finish (OG62). Extremely high grade Cu (>40%) was analyzed by classical titration methods (Cu-VOL61). ALS Minerals is an Accredited Laboratory operating under a Quality Management System (QMS) designed to ensure the production of consistently reliable data, and conforms with requirements of CAN-P-1579 and CAN-P-4E (ISO/IEC 17025:2005). Kaizen has carried out limited fieldwork on the Coppermine Project to date; it has verified locations and general descriptions of all of the showings referred to in this news release other than the Nor-98, but has not conducted independent sampling to verify copper grades. Visual identification of copper mineralization consistent with the above grades has been carried out on site by Kaizen's Qualified Person, and the ALS Minerals Assay Certificate for the reported samples has been verified by Kaizen's Qualified Person. Chip samples are believed to have been collected by industry standard sample collection procedures across the strike of mineralization. Chip samples of this nature are intended to verify grade and element associations in well mineralized showings and no inference as to the grade of a larger volume of rock can be inferred. Kaizen's disclosure of a technical or scientific nature in this news release has been reviewed and approved by John Bradford, M.Sc., P.Geo. and Chief Geologist for Kaizen, who serves as a Qualified Person, as defined under National Instrument 43-101.